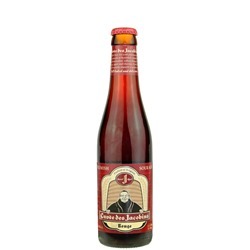 Omer Vander Ghinste Brewery's Cuvee des Jacobins Rouge is an unblended sour ale that pours a deep dark red with a medium tan head and a moderate 5.5% ABV. 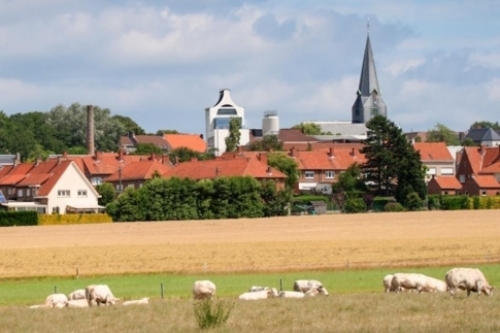 Though technically not a lambic (it is not produced in the Senne River region of Belgium), the brew nevertheless depends on local, wild airborne yeasts for spontaneous fermentation – no cultivated yeasts are ever added – and then matures for at least 18 months in French oak barrels. Sharp aromas of cherry, vinegar, cranberry, oak and caramel give way to an equally complex flavor profile that further includes sour apple tartness, red currant sweetness, and hints of vanilla and toffee. A creamy mouthfeel leads to a clean, dry finish. Pair with a fresh, young soft goat cheese; this slightly sour brew enhances its creaminess. This and other sour ales are lovely paired with zesty salads or peppery style cheeses like Monterey or Pepper Jack and pungent style cheeses like Gorgonzola and Limburger. Serve at 43 - 47 degrees F.